Neotoma Explorer is designed to be the one-stop portal for Neotoma data. An interactive web application for searching, examining, and downloading published datasets, it is the easiest and most commonly used way to access Neotoma data holdings. Click on the image at right to try it. 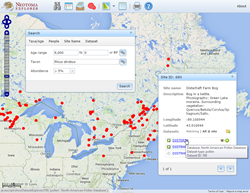 To find data, use the interactive map to zoom in to your region of interest, then use the Search options in the left panel to choose data type(s) and enter additional search parameters (investigator, geographic place name, taxon name, etc.). Press the Search button to display results by site on the map. Clicking on a site will put it in your Site Tray, ready for further exploration or downloading. Expand sites in your tray to see specific datasets available. Double-clicking a dataset will open it in the Explore view. From there, you can inspect the full data table, look at a stratigraphic diagram for the most common taxa at a site (currently available for pollen data only), view basic metadata, and examine plots of the age model and its chronological constraints. Go to the Neotoma Explorer!